Explore the world’s most renowned wine regions with extraordinary access to top winemakers and their incomparable wines. With Wine on the Road tours, international wine writer and Chief Wine Sherpa Ben Weinberg has created the ultimate in wine-focused, behind-the-scenes wine country experiences, combining award-winning wines and exquisite dining and lodging with uniquely local flair and flavor. 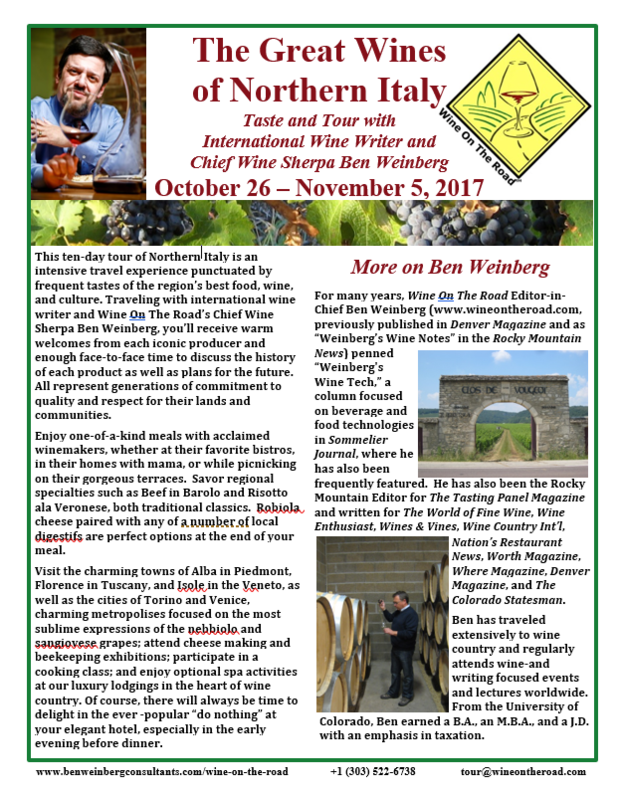 This tour of the Great Wines of Northern Italy includes Alba, Piedmont during the Truffle Festival, the Sagra del Tordo festival and feast in Montalcino, Tuscany (home of Brunello), and Venice in the Veneto during the Biennale. This tour of the Great Cities of Europe includes a D-Day tour of Normandy Beach on June 6 followed by cider and Champagne, as well as time in Paris, Rome, and Vienna.